If I were the type of blogger who was EVER organized, and put posts in little categories, we all know there would be a very FULL category labeled, “Public Freakouts.” It would include this one, this one, and this one just for starters. However! Today!!! Today there was a public freakout of the cutest variety possible, and it was NOT me. At preschool today a dear little mommy had a massive, irrational freakout that was somehow the most endearing adorable display of hormonal surges I’ve possibly ever seen. She’s pregnant. I thought MAYBE 4 or 5 months, but no. As in, possibly in labor right now, tomorrow at the latest. WE small talked (yeah, i CAN do it if I have to but I try to avoid the preschool hallway so i never have to) and then she turned and small talked with another mommy on the other side. Next thing I know she’s bawling. And she’s talking, but i have NO idea what she’s saying. Do yall cry like that? Where you cry and you THINK you’re totally making sense but instead it comes out like a lot of consanants and no vowels and hiccups in between? Yeah. It was like that. And the other mommy goes all big-eyed and wraps her up in a hug and says the sweetest things to her to calm her down. That mommy rocked. I was so glad that happened AFTER she small talked with ME because I don’t think I could have done that whole comforting thing nearly as well as that other mommy who clearly must be her best friend. So I THINK what she’s upset about is that the baby is about to be born and might be really little since she’s so tiny this bundle could be premature… and so of course she’s upset…? SideNote: Where’s this sweet mommy’s giant tummy the rest of us have to have at that stage? Not that I’m complaining. Oh fine. I am SOO complaining. What is it with the hugeness of pregnancy? I mean, some people – not even just tall women – can have perfectly normal healthy babies and NOT turn into a Suburban in the last trimester. WHY CAN’T WE ALL? Really. And I know what you’re thinking, and no. I’m done having babies. Done done done done. But when you have lots of kids, and there are large chunks of your life filled by the months where you were the size of a flesh toned Suburban, it sticks with you a bit. (and isn’t that when people start putting a well meaning hand on your stomach and telling you straight out LIES, like ‘you’re glowing…?’ Gah! That’s just a nice way of NOT saying ‘you look just like my SUV…’) The kids are all alive and healthy and I’m grateful that it all went according to plan — but if all that coulda happened without QUITE the same girth, then that woulda really been nice. That’s all I’m saying. So. Then I realize that she is NOT concerned about the baby’s size or health, it’s the sweet baby’s birthdate she’s upset about. I collect Seth-4yr, kiss his little head, and cannot slip by the Freakout in Progress because they’re blocking the door. I offer brightfaced, totally lame reassurances that everything is going to be great and she’ll do just fine and really I have no real idea why she’s so upset, except that she’s within 48 hrs of giving birth and duuuude. That is hormonal roller coaster style Reason Enough. And I’m thinking… whoah. She’s about to have a girl. She wanted a boy. She’s ABOUT to have a girl, like maybe in a second in the hallway here and she really wanted a BOY. Well great. What do you say to THAT?! I mean, usually if that’s the case you get over it before the 9 months are up and you’re totally thrilled with the one you’re getting… right? Well. Then. That was not what I was expecting to hear at all. And who does want a ghoul baby… really? (Mommy and Daddy ghouls. Duh. Okay.) She REALLY didn’t want her baby to be born on October 31. It was a big deal, and I can get that. The three of us talked about the advantages of fall birthdays and I brightly said something about bobbing for apples. Oh yes. I really did. I do comfort SO well. Not that it matters, but does anyone LIKE bobbing for apples? Water gets up your nose. Water that other people’s wide open spitty mouths has been in – gets up your nose. If you have TMJ issues, that’s just recreational jaw pain games with extra spit. Festive! I wonder if this baby – who may or may not have an Oct. 31 birthday and who may or may not be a girl (never found out) – will ever have birthday parties with apple bobbing activities partly because of an inane comment made to the sweetest pregnant mommy ever. I hope not. But if it is a girl she should be entirely thrilled to learn one day that she has probably inherited the ability to cry her head off and still look gorgeous and be very pregnant and still look to be in the ‘just found out’ phase. So… the writing. Since y’all are nice enough to care/ask and that is so sweet. I’ll get to it in a post or two… but the short version- answer is: About every five seconds I think, ‘Dude. Really need to WRITE.’ And then I don’t. Long version to come soon. Yesterday Mom looked at my bed and said, “There’s an amazing amount of STUFF in this bed.” I think she was considering napping there and commenting (subtly) on how it might not be comfortable. Possibly. I am SO not good with subtle, and that possible meaning only just now occurred to me. I took that particular observation at face value and explained all the items. Lots of little boy clothes. Caden-5yr and Seth-4yr came in very early in the morning and snuggled with each other while I was in the bathroom showering. To get them OUT of bed I brought them all their clothes and let them get dressed for the day while still in bed. Worked beautifully, except they left all their dirty clothes behind. And a few items that they rejected as possible attire for the day. As if I’m supposed to KNOW what Seth-4yr means when he says, “No, Mom. I need to wear spicy jeans. And those. are. not. spicy.” The odd thing is I have TRIED to determine what spicy jeans are. I never get it right. Yesterday I gave him a little shimmy and asked if he thought my jeans were spicy. (Y’all. Do not be alarmed. I shimmy with all the effectiveness of a prairie dog. It was meant to be comical. Not that Seth-4yr appreciated my attempt at understanding, humor, or shimmying. He did not.) Seth-4yr just made a face and said, “No! Your jeans are not spicy. AT! ALL!” And really, I’m good with that. I don’t even like salsa on chips. Seth-4yr rejected my jeans choice for him and found his own spicy-enough-to-wear pair. So I THINK this is all that’s on the bed, but no. Around midnight I climb in and it’s FREEZING in those sheets and I pull up the covers and something really, really hard hits me in the TEETH and that is SO not how you want to go to bed. Some inventive child had put a black matchbox car inside the duvet cover. INSIDE. Just a little present. Here is a hard metal object to smack you in the teeth, and sweet dreams. Miraculously, she did take a nap there. Not that I moved anything. I just inventoried and left her to it. I’m real helpful like that. *i don’t write about m u d here anymore. the weird spacing of letters is intentional. you wouldn’t believe what happens when I talk about that particular hobby, but it’s bizarre and i want no part of it. I have a favorite car wash. It’s nothing special. Just a place where there are bays where you wash your own, and one drive-through gas station style car wash. I like it because there are never very many people there. It doesn’t really do a great JOB in the cleanliness department, which may be why there aren’t ever very many people. Either way, it doesn’t matter to me. Mom (and often known as J-Mom), owner of new sparkly car, asked me to show her location of Favorite Car Wash. We go, and she pulls in behind automatic gas station style car wash area since another car is inside, already starting the rinse cycle. “Oh, there’s a ‘Bug Wand.’” She reads off the helpful sign labeling a big squeegee in a bucket of pink liquid. “Uh huh,” I say, just as helpfully. I launch into a description of the merits of pre-scrubbing bug guts with pink juice and how it’s particularly necessary after a long Texas road trip. Which she has just made. As only a mother can, she raises her eyebrows over the top rim of her sunglasses until I say, “oh! You’d like me to do that…? Right. Well then. Thought you wanted a description…” and my voice trailed off as I got out of car and made my way to the bucket of pink juice. The bucket of pink juice is revolting. I’ve used it before, and I know what I’m dealing with here. The last time, the pink liquid RAN. DOWN. MY. ARM. It’s pink. It is heavily fragranced in order to disguise the odor of bug guts, and oh yeah there are Lots of Dead Bug Parts floating within. I carefully lift Wand from bucket, taking care not to let liquid make a break for my armpit again. Head to front of new and sparkly car and get BLASTED from behind as the car already in the carwash reaches a particularly wet part of the cycle and a whole lotta that water comes straight out of there and all over me. We live in West Texas, where the wind is REALLY strong. People four blocks away were getting lightly misted and not knowing the source — and me standing two feet from the entrance during Power Rinse was really just asking for trouble. I scrub bug guts dutifully and as fast as possible, partly because of the whole Outdoor Shower thing, and partly because I am familiar with this car wash, and I want to be back in car before the soapy foam stuff starts falling from the sky. It’s tricolored, and smells of many kinds of fruit. I hate fruit. Real fruit, fake fruit, and real or fake fruit smells. Gross. I make whiny faces at my mother through the windshield, finish scrubbing, replace Bug Wand in nasty bucket of pink juice and get back into car soaked and laughing, and safely before fruit fumes invade. Altogether a success. No pink liquid (with bug shaped chunks) on my person and grateful J-Mom eyebrows over the top of her sunglasses. Anyway, I owed her. She stomps spiders for me. *and for this, I am extrememly grateful. 1) If you have skylights installed everywhere in house, suddenly every day after that will be overcast. Even here, where it is never overcast. 3) God wouldn’t say that. I know that. Duh. I was kidding. 4) Mom’s cat (and Mom) are living with us while her house here is built. 5) This cat came with her from Australia. 6) Our cat wishes he would go back. 7) He won’t. He applied for and successfully obtained Permanent Residency status. 8 ) Australian Cat eats the dog’s food, so we put the food in the (American) dog’s kennel and lock the kennel door. 9) American Dog does not like to eat food in kennel, and stages hunger strike. Also, he won’t eat outside. 10) I’m calling Mom’s cat “Australian Cat” because I didn’t ask if she’d mind if I used her cat’s real name. 11) Now I’m thinkin that’s pretty crazy. 12) Never can be too careful on the web. 13) And I LOVE me some anonymity. Let’s extend it on out to the felines of all nationalities, yessirree. 14) Anonymity is why I will never have my kids’ names and sport teams on cute stickers on the back of my car. 15) I’m sure my kids will hate this about me when they find out one day and think I do not support them fully in all their athletic endeavors. 17) Oh! I just remembered. I did this before, too. Her cat shared the name of a political candidate and every time I saw his signs I cracked up. 18) It was a weird name, and it SO seemed like those signs were saying: “My Mom’s Cat for Tax Assessor.” Or something. 19) And (that was a different Australian Cat, actually) so I wrote about it but I wouldn’t use his real name. 20) Feline Anonymity. It’s a real pressing issue. 3 boys home sick. Actually, just 2, since Seth-3yr doesn’t go to school today anyway. So Caden-5yr and Ethan-9yr are home sick. However. They aren’t. Of course I didn’t. I just briefly considered it. How’d they end up at home anyway? They didn’t fake it. My kids almost never do that because school is way more fun than a day with me and really i’m not that special to them and haven’t been since they lost the need for lactation. I just THOUGHT they needed to be home. There are so many sick bugs going around, and there’s a HINT of a symptom here or there… My mistake. But by 10:30 this morning, Mom and I looked at each other and realized I had made, perhaps, a waaaay too-cautious choice in keeping them home. Boys flying off furniture, playing football in backyard, careening through rooms… the picture of 3 healthy boys. Awesome. Note to self: That’s a blessing. Repeat Note to Self – through clenched teeth if necessary – as 3 boys run through house with muddy shoes. BLESS. ING. By noon, they were clearly so healthy, (and driving us nuts) that we took them to lunch. In the parking lot of Cotton Patch, I told them that if anyone asks, do NOT say you are home sick from school. We already looked suspicious, as the three of them insisted on wearing stretchy knit winter gloves. Yes. 3 boys in gloves at lunch, on a day when the high will be in the 80s. Caden-5yr outdid his brothers by wearing a gold tone plastic necklace with a giant “$” symbol. This lovely item came home as a souvenir from the Fair, and it has hardly left his person since. I’m thrilled. He looks like a darling, blond, preppy child with an admiration for 50 Cent’s fashion sensibilities. I don’t say anything, of course. My mother doesn’t say anything (usually) when I wear odd things either. After all, that’s what sisters are for. 1) As mentioned before (and never explained, and how inexcusable is that? ), someone wonderful died. Suddenly, and while visiting us for the holidays. His name was Colin, and we all loved him – but most of all, my mother loved him. 2) He loved her, too. Deeply, sweetly. He spoke about her strengths and quirks and talents with great gentleness and admiration. He had a deep appreciation for everything that was good in his life — and she encompassed a lot of that. 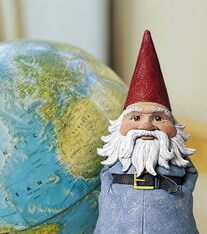 4) He looked like the Travelocity gnome, especially when he wore a hat. 5) He had a lovely Scottish accent. About a week before he died, he spent hours telling me about his kids’ growing up years. He probably would have rather been napping, but I’m so grateful for that one long, uninterrupted afternoon we talked while the kids slept. 8 ) On what turned out to be his last night, I made a truly dreadful meatloaf. I don’t cook well at all, but he liked meatloaf, and I figured I’d try. It was awful. He was so kind about it though, and he actually called for a round of applause during dinner for the Meatloaf Effort. No, he didn’t call it that. He pretended it was lovely. It wasn’t. And it was his last dinner, and he was so very gracious. 9) My meatloaf (or perhaps anyone’s meatloaf, but especially mine) should never be anyone’s final ‘send off” meal. 10) List format didn’t help diffuse anything, and am crying eyes out. He was truly wonderful. He’s missed.